Stunning photographs from the Archives of the British Motor Industry Heritage Trust are now available to buy as prints, framed prints, canvases and personalised collages. The British Motor Industry Heritage Trust has joined forces with Motorfilms – the team behind Heritage Motoring Films and Motorfilms Quarterly – to bring you the best of their picture library online. Now you can browse through more than 100 years of images depicting motoring, racing, rallying, advertising, manufacturing and social history, using marque, year and collection as filters to refine your searches. 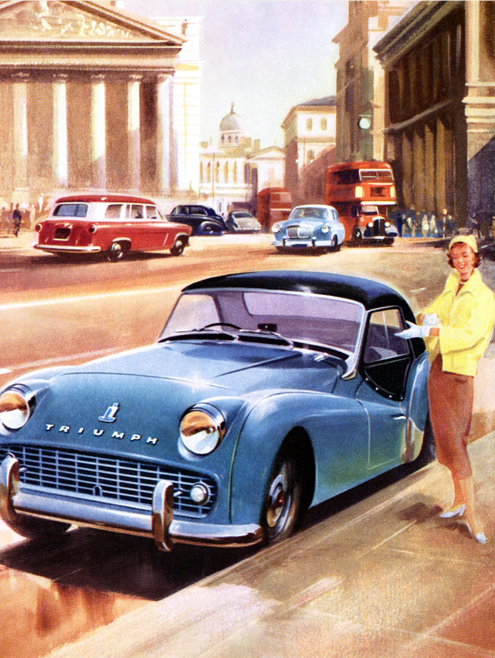 Choose from classic marques such as Austin, Austin Healey, Morris, MG, Mini, Rover, Land Rover, Standard, Triumph, Riley and Wolseley; advertising and fashion from the roaring twenties to the swinging sixties; giants of the motor industry such as Herbert Austin, William Morris (Lord Nuffield), Alec Issigonis, Cecil Kimber and the Wilkes brothers; the rich and famous including Kings and Queens both here and abroad, Margaret Thatcher, Winston Churchill, Harold Wilson and many more; and a get a glimpse of the British motor industry in its heyday including the bustle of the production line, behind the scenes in the offices and off-duty social activities at iconic factories such as Longbridge and Cowley. The Trust can offer only a small proportion of its total holdings on this site and the images available will be changed and extended at regular intervals. Prints for private use can be obtained directly from the site. Scans for commercial purposes such as publication or press, graphic, and exhibition use are also available on request. If you are interested in licensing or have any other requirement which does not presently feature here please use ‘contact us’ to make your enquiry.